A fantastic collection of original 'Dallas' scripts from the internationally successful television series from the 1980's. Every script is approximately 35 years old and provides a fantastic insight into the behind the scenes production. 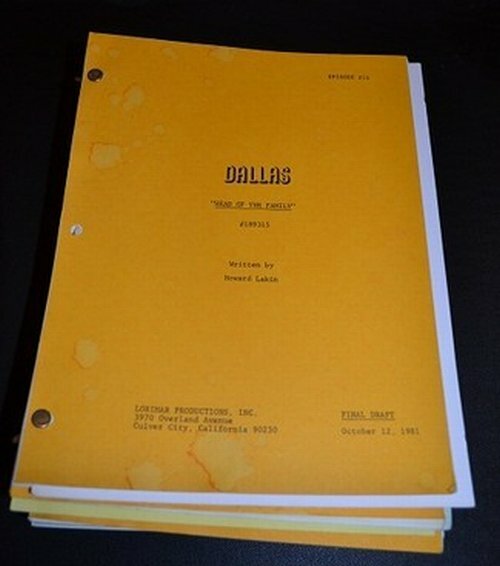 Each script is 45-60 pages long and includes a front cover displaying the famous 'DALLAS' logo, the title of the episode, the number of the episode, the date, the name of the writer, the version of the script eg. Final Draft and of course the name and address of the production company Lorimar Productions Inc, Culver City CA 90230. They are all in good condition although do show varying signs of use including marks or finger prints to front and back covers, some with a little fading or small creases, some with a crew members name written on the cover. Acquired directly from the USA each original script comes with a certificate of authenticity guaranteeing it was used in the production of the original television series. Once you have placed your order please email sales@originalmemorabilia.co.uk with your choice from the list below.